Knife or scissor dressed sheet mica with irregular shape and a minimum thickness of 0.18 mm (0.007 inch or 7 mils) are called Mica Blocks. Block Mica are classified into thirteen size groups (ranging from OOEE Special down to No. 7) and obtained in size as large as 30 - 35 cm sq. (12 - 14 inches sq.) beyond which is practically rare and far too expensive. It is available in sheets with both random (natural) and calibrated thickness as per demand. 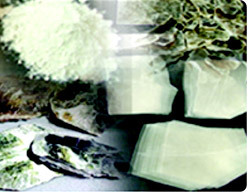 After undergoing size and quality grading, Mica Blocks are exported. Knife or scissor dressed sheet mica with irregular shape having a specified thickness range between 0.05 to 0.18 mm (0.002~0.007 inch or 2~7 mils) are classified as Mica Thins. It is used to manufacture various kinds of fabricated mica. Knife or scissor dressed superior quality sheet mica having thickness generally less than 0.05 mm (0.002 inch or 2 mils) are classified as Mica Films. It is used in the manufacture of silvered mica plates for mica capacitors. Laminae split from mica blocks and mica thins where the combined thickness of ten sheets taken together does not exceed 0.30 mm (0.012 inch or 12 mils) are classified as Mica Splittings. Splitting Mica is chiefly used in the manufacture of micanite or built-up mica products for ultimate use as an insulating material. It is available in "Loose Form" and "Book Form" types. Mica recovered by means of hammer crushing, processing and screening of crude mica having an average area between 12 to 50 mm sq. (1/2 to 2 inch sq.) is defined as Mica Scrap. All Mica Scrap are substantially free from mineral and non-mineral impurities as well as other foreign inclusions. It is exported to plants all over the world and finds paramount use as a primary raw material in the manufacture of mica paper or re-constituted mica. Domestically, Mica Scrap is used as a basic material for the manufacture of Ground Mica Flakes and Powders. The term Fabricated Mica applies to cutting, stamping and punching of natural sheet mica to a specified size, shape and thickness within close dimensional tolerances for electrical and electronic end-uses. Most of the Fabricated Mica components are custom built against provided specifications and drawings which are subject to change from part to part. The fabrication is performed by using foot or power presses with the help of compound dies/tools. The mica may also be hand-sheared, drilled or lathe-turned. They are produced into innumerable designs each differing in size, pattern, thickness and quality from one another. Mica Shields are used with flat transparent sight glasses in water and liquid level gauges and columns of high pressure steam boilers. Mica Shield provides protection, retains basic strength and increases service life of sight glasses when used at extreme steam pressure and high working temperature. It is used as an ideal transparent medium for monitoring the liquid level and pressure of steam. Mica Disc provides the best protection to circular viewport glasses and perfect visibility for checking the degree of combustion and liquid level in high pressure steam boilers. It is also used in breathing apparatus, communication devices, fuses, geiger counters, broadband waveplates for optical instruments, etc. Precision punched mica parts according to specific shapes and dimensions are used as mounting washers and reliable insulators in power transistors, diodes, IC's, heat sinks, rectifiers and other semiconductor devices. It helps the semiconductors to be insulated from the chassis, dissipate the heat away and keeps them cool. In the form of bridges or spacers, it is used in radio and television vacuum tubes. These spacers serves to hold the tube elements in position, insulated from each other and at uniform distances. Mica Wrapper is wrapped or rolled into tube form that are eventually placed over the soldering iron electrodes. It plays vital role to eliminate physical contact between the resistance wire and copper bit ensuring dependable service life. Corrugated or Crimped Mica is prepared by passing through a specially designed rolling machine. It is supplied in the form of vertically corrugated ribs and mainly used in wrapping the soldering iron electrodes. It plays important role to eliminate physical contact between the resistance wire and copper bit ensuring dependable service life. Owing to high transparency, flatness and thermal endurance, Mica is used as viewing windows for kerosene stoves, wood stoves, petromax lamps, furnaces and fireplaces. Such natural mica washers can also be bonded into considerable lengths with shellac, epoxy or silicone binders to form a solid roll which is then called Bonded Mica Washers. Maximum use is in railways and grid resistors. Superior and high quality of mica are suitably used in microscope slides for scientific research in laboratories. They have outstanding even surface, uniform layer, clear transparency and are scratch-free. Metal casting foundries pour their melts through Mica Strainer Core to eliminate impurities and control the pour rate. Mica Strainer Core having 22 to 148 holes acts both as a choke and strainer during pour. Small cut parts of mica are effectively used as backing plate on both top and bottom sides of mica capacitors to give mechanical strength and rigidity. Superior quality mica films with specified size and shape are screen printed with silver paste to be used as an electrode in the manufacturing of mica capacitors. The accuracy lies in precise thickness, clean-cut edges and flawless quality. High resistance nichrome or electrical wire is winded around natural mica providing quality insulation for use as heating elements in irons, toasters, kettles, rice cookers and other electric heating appliances. It is available in all usual sizes/patterns in different voltage and wattage as per specifications. By far the largest use of mica, both quantitative and application wise, is in the form of Ground Mica. It is prepared from grinding and breaking of mica scrap or waste namely by Dry Ground process. The production is economically carried out in high speed rotary hammer mills or pulverisers transforming into mica flakes and mica powders of different particle sizes. Meticulous care and precaution is taken to avoid deterioration of its natural brilliance, colour and properties. By virtue of its outstanding characteristics and exceptional values, Ground Mica have shown phenomenal growth rendering extensive usage in many diversified industries, in certain spheres as vital and as significant as one could well imagine. Mica Flakes is indispensably used in the manufacture of pearlescent pigments (pearl luster pigments) which consists of natural mica flakes coated with titanium dioxide and/or iron oxide. They possess high reflective and refractive index imparting natural pearl-like luster and magical gloss with abundant fascinating colours and enticing appearance. The unique characteristics makes it most distinctive and deeply promising in the present age. Pearlescent pigments are applied to numerous industries like paint, plastic, coating, printing ink, leather, cosmetic, dyeing, ceramic, rubber and paper. Substantial quantities of Mica Flakes are processed for producing wet ground mica powder. The mica is milled with technique to preserve the structure and the sheen or luster of mica platelets without altering its natural properties. The wet grinded mica product is characterised by high quality, good purity, brilliant whiteness, large diameter-thickness ratio, regular shape and smooth surface. In addition, the product is resistant to heat, electricity and chemicals. It is widely used in such fields as pearlescent pigment, plastic, paint, cosmetic, coating, lubricant, rubber, etc. Compared to other materials, the wet ground mica powder emerges as an excellent performer. Mica Flakes are effectively used in water-based oil well drilling operations as a mud additive chemical to prevent loss of circulation and seepage in loose formations. Mica is specially added to overcome the lost circulation zones. The platy structure of mica facilitates the overlapping of particles to form a tight layer or wall and acts as a sealant that bridges the openings. Mica-mixed drilling mud helps to seal porous sections of the drill hole and contributes to regain circulation keeping the solids in suspension. Generally three grades of Mica Flakes (Coarse, Medium and Fine) are normally used for specific purposes. High quality white Mica Flakes are used for bright and artificial snow impression. In addition to being beautiful, mica is non-toxic, tough, chemically inert, water resistant, fire-proof and transparent. As a decorative material to produce shimmering and glittering effects, it is used by christmas tree flockers, candle makers, floral designers, scrap bookers, wedding designers, artists, crafters and many more. It is also used to adorn and prettify wall papers, fancy papers, greeting cards and various novelties. Mica Powder is well recognized for use in the manufacture of welding electrodes as a flux coating on the metal wire. Mica is added to the flux with which welding electrodes are coated as arc stabilizers, weld pool protectors, fluxing agents, slag modifiers, binders, extrusion agents and pigments. Potassium also facilitates re-ignition of the welding rods after interruptions to the current. The Mica coating provides two distinct types of protection. Firstly, it serves in forming a fusible slag and a good seal at the fusion zone of the arc. Secondly, it resists the action of heat, gaseous and other surrounding atmospheric oxidation. In fact, it is the nature of mica coating that largely determines the quality of welding electrodes. Significant volume of Mica Powder are used as a filler in light weight pre-fabricated gypsum wallboards, slabs and panels for building constructions. Mica is light in weight, fire-resistant, free-flowing, chemically inert and non-abrasive. Sound suppression, good thermal and insulation properties, dimensional stability and extremely low water absorption are some of its additional outstanding features. All these desirable characteristics makes mica an ideal and justified filler in plasterboard industry. Mica Powder is a cost effective filler and extender in wallboard joint cement compounds. It is used for filling and finishing the joints, seams and blemishes on gypsum wallboard, between adjacent sheets and other structural constructions. Mica acts as a reinforcing agent improving the workability of compound by preventing cracking, eliminating peeling and reducing shrinkage. The wall surface is protected from moisture absorption since mica particles are insoluble and impenetrable by water. They also provide smooth edge and decorative texture of the wall surface. Fairly large tonnage of Mica Powder are used as an inert filler to asphalt and bituminous compositions. Applied as a surface coating to rolled asphalt roofing felt, shingles and damp coarses, mica increases hardness and resistance to mechanical stress and weathering. Mica prevents sticking of adjacent surfaces during manufacture and storage. The coating is not absorbed by freshly manufactured roofing because of the platy structure of mica. It imparts glistening appearance and enhances durability of the roofing product. As compared to other materials, the viability of mica is proven for the above purpose. Mica Powder is extensively used as a filler in acoustic compounds in the manufacture of automotive components to control noise and insulate the heat generated by commercial vehicles for the comfort and well being of the driver and passengers. The advantages of anti-vibration, sound damping and heat protection utility of mica cannot be neglected. Besides, the addition of mica in acoustic products significantly improves the properties such as increased strength, stiffness and dimensional stability. It also reduces flammability and warping. The most wide-spread application of Mica Powder is in automobiles. Mica is used as a reinforcing material in light weight plastic automobile parts such as fascia and fenders, car seat backs, panels and ignition systems. Mica-reinforced plastic imparts improved mechanical properties together with increased strength, rigidity and stiffness. It also provides high heat dimensional stability, temperature resistance, reduced warping and the best surface properties of any filled plastic composite. Mica Powder is used as a friction material for asbestos-free brake lining, brake pads, brake shoes, brake discs, clutch facings, etc. Due to the high thermal resistance of mica, it reduces the flow of heat and helps to keep the brake drums cool. Mica particles are stronger than iron which serves to strengthen and solidify the product preventing microscopic ruptures and minimising warping. Owing to platy structure of the mica, it tends to lock together under compression during processing to form an effective and superior surface. The benefit of mica is also recognized to curb noise and provide active environmental protection. Mica Powder is broadly used as a functional filler for plastic industries which provides reinforcement. Addition of mica results in high heat resistance, barrier to chemical attack, increased flexural strength and stiffness, extremely low water absorption, low shrinkage and coefficient of expansion, improves dielectric and surface properties of plastic composites. Consumption is suitably dominated in engineering thermoplastic commodities. Mica Powder is an important constituent as an extender and filler for paint manufacturing. The platy structure of mica reinforces a protective coating in paints. The addition of mica facilitates suspension, reduces cracking and peeling, prevents shrinking and shearing of the paint film, increases resistance of the paint film to moisture penetration and atmospheric weathering, augments performance and brightens the tone of coloured pigments. Utilisation of mica in paints is universally well established for its functional properties. Mica Powder is essentially used and added in the formulation to keep the powder in dry fire extinguishers free flowing. Mica is fire-resistant and retains the powder mixture from packing tightly in the canister. Mica Powder is used in the manufacture of insulating bricks, slabs, blocks and tiles because of its excellent thermal and insulating properties. Since mica bricks can safely withstand extreme temperatures of 1000�C, it keeps heat losses to minimum, minimizes energy consumption, reduces operating costs, enhances furnace efficiency and improves furnace room condition. An additional advantage of mica bricks is stability after long use. Micanite or Built-Up Mica are manufactured with layers of overlapping mica splittings laid-up by hand or mechanical process and bonded with selected resins (such as shellac, epoxy, alkyd, silicone or other agents) in order to obtain characteristics for specific end-uses. It is then cured under high heat and pressure. Diverse range of composite binders are available according to temperature resistance and thermal insulation class namely, 'B' (130�C), 'F' (155�C) and 'H' (180�C) to match different applications. For particular products, Micanite or Built-Up Mica are produced with numerous backing materials (such as glass fabric, polyester film, nomex paper, etc.) to form a laminate which provides additional mechanical strength, flexibility and tensile strength. Variations can be made in the method of production to manufacture thick or thin, stiff or flexible micanite products in the form of sheets, tapes, tubes and also moulded articles. Micanite or Built-Up Mica is a vital insulating material employed for today's electrical engineering industry without which many machineries and equipments would have to be made to operate at greatly reduced efficiency. Made from mica splittings bonded with modified shellac or other resins. Moulding plates are rigid at room temperature but softens when heated at temperature between 100� to 140�C. They contain relatively high level of binder content to have necessary flexibility for easily moulding into any desired shape upon heating. On cooling, they will regain rigidity and retain the shape of moulded forms. Application	:	Are chiefly used for the manufacture of commutator V-rings and cones, end-caps, channels, angles, bushings, decorative lamp shades, etc. Made from mica splittings bonded with shellac or other variety of resins. The percentage of binder content is kept relatively low. These plates are rigid, hard and dense. They possess excellent punching ability to any specified shape and design. Application	:	Used for heating elements in electrical appliances, furnace insulation, washers for high temperature applications, heat barriers, etc. Manufactured in continuous rolls comprising of mica splittings bonded with various kind of resins. It is reinforced on one side with kraft paper or other backing material based on required amount of mechanical strength, dielectric strength and flexibility demanded by the applications. Application	:	Mainly used in forming tubes, casings and cylinders. Suitable for insulation of bus bars and also used as slot, wrapper, separator and layer insulation in both low and high voltage installations. Made from mica splittings with heat resistive bonding resins and agents. They possess excellent flexibility and permits wrapping or winding of the sheets at room temperature without heating. The sheets may be supplied without reinforcing backings. Flexible Micanite are also reinforced with a protective backing on one or both sides which provides additional mechanical strength, dielectric strength and flexibility. Application	:	Particularly suitable where cold wrapping of insulation is required. Used in wrapped insulation of motors, generators and transformers, slot liner, ground insulation, electro-magnetic coils, armature windings, etc. Made from mica splittings incorporating low level binders. The sheets are heat pressed, completely cured and subsequently grinded at both sides. These rigid, flat and smooth surfaced sheets exhibits high thermal stability, good voltage endurance and excellent mechanical strength. Other properties are outstanding shearing and punching ability. Because of the thickness accuracy and stable compressibility, the material can be applied to commutator assembly works quite conveniently and comfortably. Application	:	Commutator mica sheets and its related punched components are used as separator between the copper segments of commutators in electric motors, traction motors, turbo-generators, etc. V-Rings or Cones are initially cut out of Moulding Micanite sheets. It is then moulded under heat and pressure to match individual specifications with the help of moulds/dies specially prepared for the process. It gives excellent results but is labour intensive having slow production. Application	:	Specially used as an insulation in commutators of high voltage rotating machines. Made from Mica Folium sheets in different dimensions. The sheet is wounded and heated at elevated temperature to form rigid tubes. Desired wall thickness along with required inside and outside diameters are acquired. Application	:	Used in switch gears, commutator sleeves, brush holder assemblies, electrical resistances in industrial equipments, etc. Manufactured in continuous rolls comprising of mica splittings bonded with	various resin binders thermally adapting to insulation class. Combination of various supporting or backing materials depending upon requirements and specifications. Reinforcing material provides uniformity, sufficient tensile strength and resistance to abrasion. 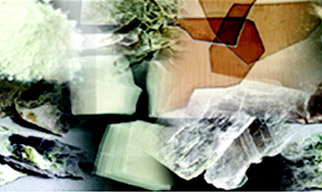 For numerous applications, tapes made from mica splittings have been replaced and superseded by mica paper based tapes. Application	:	Essentially used in coils of motors/generators/transformers, high voltage cables, insulating armature coils, windings of electrical machines, etc. Moulding Micanite Sheet with most prevalently natural shellac binder is used in	decorative lampshades over many years. Natural shellac vary from orange to dark amber in colour. The combination of mica with contrasting colour intensity and tones of binding resins create a	unique, random, lighting effect. These sheets can be mouldable into desired shape while hot. The material softens and is pliable after heating at approx. temperature 100� to 140�C for a couple of minutes. Once the sheet has cooled, it will regain rigidity and retain the shape of moulded form. Use of moulds to help shape the sheet to the curvatures desired is	recommended. Application	:	The mica shade panels are assembled with table lamps, ceiling lamps, wall lamps and grand chandeliers in varied vintage and contemporary designs and fixtures. Mica Paper is manufactured from superior quality mica scrap as a principal raw material by calcined (thermo-chemical) and uncalcined (hydro-chemical) process in the form of continuous rolls. 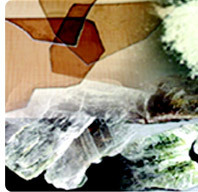 Mica Paper being an artificial mica-based reconstituted product, it retains the essential heat resistivity and electrical characteristics of natural mica. Furthermore, it is cost effective and more homogeneous having greater consistency of thickness and uniformity of properties. Assorted configurations of bonding resins (such as shellac, epoxy, alkyd, silicone, etc.) and backing materials (such as glass cloth, polyester film, polyester fleece, polyimide film, nomex paper, kapton film, etc.) are used according to thermal insulation class and requirements as demanded by applications. Mica Paper has proved itself as a highly reliable product in place of conventional insulating materials to attract considerable attention and great expectations both domestically and internationally. Are manufactured from mica paper bonded with heat resistant silicone resin consolidated under controlled heat and pressure to form rigid plates. In this process, the binder is completely cured. Characterised by excellent mechanical, thermal and electrical properties. It emits very little smoke at excessive temperatures. It provides uniform thickness and excellent punching capability. Application	:	Ideally used in heating elements for domestic and industrial electrical appliances. Custom built fabricated parts are also extensively used in many insulating and thermal enduring applications. The Mica Paper Plate or Heater Mica Plate can be sheared, punched and drilled into intricate shapes according to drawings and requirements. In-house capabilities, processing machines and tools are utilised to cope with various fabrication objectives. Application	:	Efficiently applied as heat resistive insulating materials in the form of washers, separators and tubes. Mica Paper Plate or Heater Mica Plate are ideally suitable as base, support and covering plates for heating elements. They are the versatile solution for a number of domestic and industrial applications. Made of high resistance Nickel-Chrome (NiCr) or	Ferro-Chrome (FeCr) wire winded around Mica Paper Plate. It is available in all dimensions, patterns and designs in different voltage and wattage as per specifications. Mica insulated heating elements have established to be a reliable performer providing long, efficient and dependable service life because of apparent distinctive thermal and electrical properties. Application	:	Most appropriately used for warming and heating applications in toasters, roasters, kettle, flat irons, hair dryers, popcorn makers, cookers, ovens, perculators, griddles, stoves and other electrical appliances/heaters. Also used in heating elements for strip heaters and band heaters where it is sheathed in stainless steel or brass or rust-resistant steel. Are manufactured from mica paper to tape form and bonded with various heat resistive resins according to technical requirement and application. The tapes are reinforced with several different backing materials on one side or both sides. Depending upon the percentage level of binder present, these tapes are termed "Resin Rich" or "Resin Poor". Under heat and pressure, the resins are cured to form protective covering and mechanical stability. Are characterised by excellent thickness uniformity, good thermal properties high dielectric strength and high tensile strength. Application	:	Mica Tapes perform tremendous flexibility and taping capability. Used in fire	proof cables and in the insulation of coils of large rotating machines such as motors, generators, alternators and transformers. Copyright 2005. All rights reserved. Grmica.